In addition to the larger, more well-known resorts, there are a number of smaller resorts that attract holidaymakers to Gran Canaria, and which offer all-inclusive holidays. Suffered Food Poisoning in San Agustin? Food poisoning and parasitic infections can be caught where hotels are not adequately maintained or cleaned or where there are lapses in hygiene standards. Diseases including giardia, cryptosporidium, campylobacter, E coli and salmonella can all be contracted where hotels fail to operate to reasonable standards. Tour operators and their staff may be quick to blame holiday illness on a change in environment, climate or eating habits. If you have witnessed poor levels of hygiene, then this may well be the cause of your illness. You may have suffered from an illness that is preventable and which may have long term implications in the future. The majority of hotels offered by tour operators are of a good standard. Simpson Millar’s travel lawyers watch the following hotels for reports of illness, such as diarrhoea and sickness, which may indicate poor levels of hygiene or an illness outbreak. Get Help from the Holiday Illness Experts. At Simpson Millar LLP, a dedicated team of Holiday Law experts are ready to assist you make your compensation claim. If your case is taken on, a lawyer with extensive experience and knowledge in the field of holiday law will be at your disposal to provide expert advice and assistance. To discuss your potential entitlement to compensation contact us without delay on 0808 145 1353. 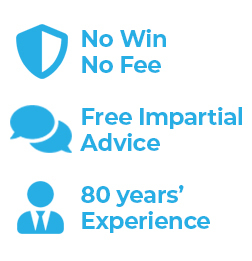 We provide free initial advice and will let you know whether you are entitled to make a ‘no win no fee’ claim.